Read about what DCIS is, how it is diagnosed, and how it is treated. DCIS means that some cells in the lining of the ducts of the breast tissue have started to turn into cancer cells. These cells are all contained inside the ducts. They have not started to spread into the surrounding breast tissue. Doctors might describe DCIS in different ways. These include pre invasive, non invasive, ductal intraepithelial neoplasia (DIN) or intra ductal cancer. In some people if DCIS is not treated, it could become an invasive cancer. DCIS and invasive breast cancer are not the same thing. 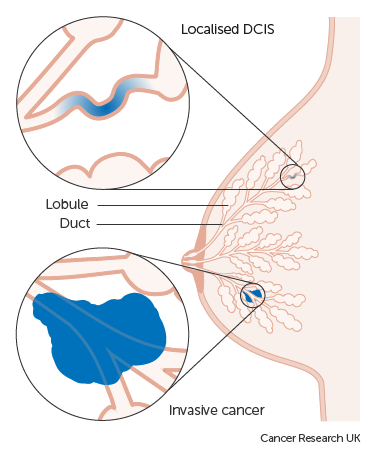 In invasive breast cancer, the cancer cells have broken out of the ducts and spread into the surrounding breast tissue. There is then a chance that the cells can spread into nearby lymph nodes or other parts of the body. Around 6700 people are diagnosed with DCIS in the United Kingdom each year. This includes about 25 men. DCIS is diagnosed more often now than in the past. It is often picked up in women when they have mammograms as part of the UK breast screening programme. Men don't have a breast screening programme because DCIS and breast cancer are so rare in men. The grade of DCIS tells you how much the cells look like normal breast cells. It gives your doctor an idea of how the DCIS might behave and which treatment you need. Surgery is the main treatment for DCIS. Your surgeon might recommend that you have a particular surgery or they might give you a choice of operations. Women have different reasons for choosing a particular operation. For example, some women prefer to keep as much of their breast as possible. Other women prefer to have the whole breast removed because it makes them feel more confident that the DCIS is cured. It is important to discuss your options with your doctor or nurse. Many women have surgery to remove the area of DCIS and a border of healthy tissue around it. This is called a wide local excision (WLE) or breast conserving surgery, or sometimes a lumpectomy. After this surgery, you might have radiotherapy to the rest of the breast tissue if the DCIS cells look very abnormal (high grade). The radiotherapy treatment aims to kill off any abnormal cells that might still be in the breast tissue. Your doctor or breast care nurse will discuss with you the possible benefits and risks of radiotherapy. If you want to, you can choose to have a new breast made (breast reconstruction) at the time of the mastectomy, or some time afterwards. Doctors are researching the role of tamoxifen and other hormone therapies as a treatment for DCIS. Trials have had mixed results. Some trials suggest that taking tamoxifen after surgery for DCIS reduces the risk of it coming back (recurrence). And it can reduce the number of further invasive breast cancers or DCIS. But in these trials, the people taking tamoxifen did not live any longer that those who didn't take it. Your doctor might suggest that you have tamoxifen if your DCIS cells have oestrogen receptors. It’s important to remember that you can contact your doctor or nurse between appointments if you are worried about a symptom or have questions. You don't have to wait for your next appointment. You can also speak to your GP. The chance of the DCIS coming back depends on various factors. But after mastectomy DCIS almost never comes back. In women who have just the area of DCIS removed the chance of it coming back is a bit higher. But it depends on the grade and type of DCIS. Your doctor can give you more information about the chance of the DCIS coming back in your case. Trials are looking at the possible causes of DCIS: for example, particular genetic changes that might increase the risk of developing it. Researchers are also trying to find out whether peole with low or intermediate risk DCIS need to have treatment. Doctors would like to improve existing treatments as well as reduce the side effects. For example, one trial is trying to find out whether internal radiotherapy (brachytherapy) is as good as external radiotherapy for DCIS. Sentinel node biopsy in ductal carcinoma in situ of the breast: Never justified?